You know, I try to start the New Year on a positive note. I take a few days off, which includes getting off social media and I limit my time online. This break always leaves me feeling refreshed and with a more positive attitude about the world. And then, roughly seven seconds after returning from my break, I read about a new “health” trend hitting America: Raw Water. And I was back to being grumpy and stressed. Raw Water is marketed as superior to tap water (and even bottled water) because it comes from a river or a spring and isn’t treated at all. No filtering, no cleaning, no nothing. Claim: Fluoride in public water (tap water) is dangerous. Truth: There’s no evidence that it’s dangerous, but there’s tons of evidence that fluoride in water has improved dental health in America (and other countries). Claim: The filtration used by public utilities removes beneficial minerals. Truth: Those minerals are also known as poop. Claim: Bottled spring water is treated with ultraviolet light to remove algae, which kills the “probiotics” in the water. Fact: Those probiotics are also called bacteria, which are known to give people diarrhea. Claim: The water from the tap just doesn’t taste quite as refreshing. Fact: This is nonsense but I do look forward to the wine water tastings. Claim: Tap water is used as mind control by the government. Fact: This is true, to those who suffer from paranoid schizophrenia. Thankfully, media coverage of this trend has been overwhelmingly negative. Yet some outlets have been cautious not to criticize too much. For instance, The New York Times suggested a more virtuous motivation behind this trend, saying raw water is part of people’s “Rush to Get Off the Water Grid,” which connects it to other, far less dangerous “off the grid” movements like homesteading and the locavore movement. The Washington Post was similarly generous; explaining to readers “…why drinking it may be a bad idea.” May? How about IS! Because it IS, without a doubt, a bad idea. And over at Time online, reporter Jaime Ducharme wrote an article titled, “’Raw Water' Is a New Health Trend. But Is It Safe?” Is it? Really? How about not asking a question with an obvious answer…to anyone with any sense of reality and the most basic understanding of history. Doug Evans brought us the Juicero machine, a $400 gadget designed solely to squeeze eight ounces of liquid from proprietary bags of fruits and vegetables, which went for $5 to $8 apiece. Though the cold-pressed juice company initially wrung millions from investors, its profits ran dry last fall after journalists at Bloomberg revealed that the pricy pouch-pressing machine was, in fact, unnecessary. The journalists simply squeezed juice out of the bags by hand. But this didn’t crush Evans. He immediately plunged into a new—and yet somehow even more dubious—beverage trend: “raw” water. Right now millions of chemicals are spilling into rivers and oceans. Synthetic toxins are rushing down from car washes, industrial waste from factories, and herbicides sprayed on edges of freeways. Synthetic fertilizers from lawns, golf courses and produce are purchased by the pallet every day. We can understand why it’s challenging to believe that a source of water with no Industrial Age contamination exists. That message is designed to scare people about safe and FREE tap water, which of course creates a market for Raw Water, which is of course, the point. People should know the very positive truth about America’s rivers, streams, lakes and yes, even the oceans, which are cleaner than ever before. Some of that is due to the Clean Water Act, which in its early years of implementation helped to improved waterways and water safety and cleanliness. Of course, water quality was improving long before that law passed as people were becoming more aware of pollution. Today, the Clean Water Act has become a bureaucratic nightmare for landowners and a barrier to those hoping to sue polluters who might harm property or public welfare. Yet, despite these issues, it’s nonsense to claim the nation’s water sources and public utilities are dangerous or in any way toxic. 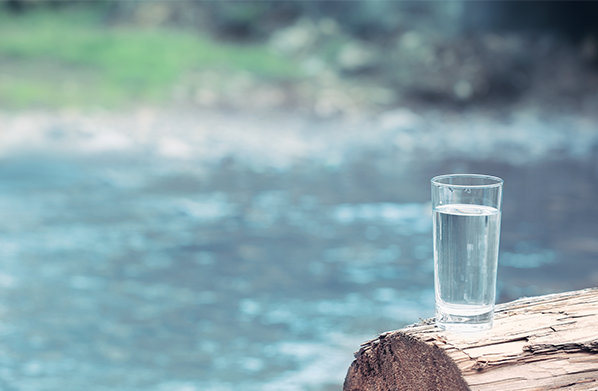 Raw Water is yet another silly health trend. Most of these health trends are harmless and silly and soon go out of fashion. But some stick around and can have serious deleterious affects on people and walk back decades of progressive improvements in the human condition. We’ve seen this with other scientific and medical advances—vaccinations, pharmaceutical interventions for deadly diseases like cancer, pasteurization, chemicals used in food preservation and in manufacturing, GMOs and pesticide use.